The swimmers, from the Swim Free Aberdeen, braved the 6C water and swam over a mile from Macduff Marine Aquarium to Tarlair Pool. Dressed in a combination of wet suits, swimming costumes, hats and goggles, the hardy group navigated the freezing water in support of the Friends of Tarliar. The friends hope to bring the council-owned pool – which was closed in 1990 – back into use. The swimmers.<br />Picture by Colin Rennie. 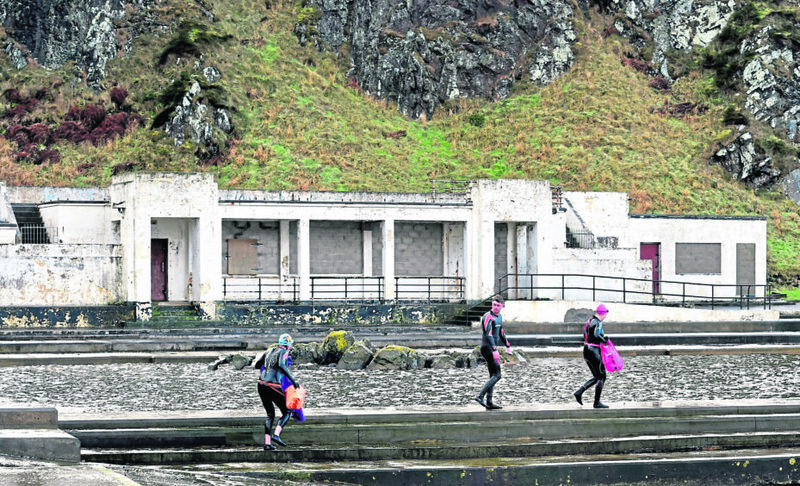 Despite £300,000 of improvements by Aberdeenshire Council in 2014, the facility remains out of use apart from as a testing facility for local model boaters. Meanwhile, the A-listed art deco pavilion has been boarded up since the site shut. Lorraine Smith, Friends of Tarlair treasurer, said: “At the moment we’re trying to raise awareness of Tarlair and we’re hoping to get a lease of the pavilion there from the council. 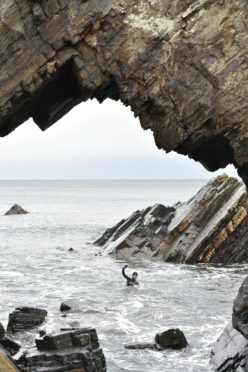 One of the swimmers who braved the North Sea, swimming over a mile from the Macduff Aquarium to Tarlair outdoor pool to raise money for the Tarlair pool. Picture by Colin Rennie. “As it stands the council cannot get the funding to make use of the building but our organisation is able to apply so we’re hoping to get the lease. “When we were younger the pool used to be open from May through the summer but we want the facility open all year round so the community can use it. “The area would be perfect for a gallery, for indoor sports, for community events and all sorts. “Water sports is also a big thing now so that could evolve more in the area too. “The Swim Free Aberdeen group has just done its second swim here – I think they’re nuts but it’s raising awareness and funds for Tarlair.